Mollie is the co-director and owner of Sadhaka Yoga and creator of Grace and Presence Yoga Teacher Training and Mentoring Courses. She has over 12 years of experience teaching, mentoring and encouraging people to live healthy, happy, mindful lives. 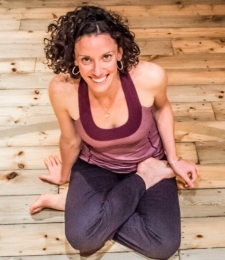 Inspired by the wisdom of the ancient sciences of yoga and Ayurveda as well as the abundance of possibilities in the modern world, Mollie will help take your practice to a new level of depth, strength and awareness. Her signature style unites the beauty and wisdom of the yogic teachings with self-inquiry, physical challenge, mindfulness and fun. Read our recent interview with Mollie here.